The crossover market is becoming increasingly crowded. More manufacturers are getting in on the game, and that means it’s harder to stand out from the crowd. One of the recent entrants comes from Fiat. The Italian manufacturer is building its core range around the popular and stylish 500. The crossover variant is called the 500X. You can opt for either ‘City’ or ‘Off-road’ look, and in seeking a true crossover I opted for the latter. So is it a harmonious blend of city and countryside? I set off to find out. You need only glance at this car to know which family it is a part of. The ‘500-like’ touches are obvious, but the whole car feels more beefed up. The Off-road look 500X gets plastic trim around its lower edge, and contrasted against the Passione Red paint created a rugged appearance. At the front the lights are very much reminiscent of the 500. To the side you get 17-inch, two-tone snowflake alloys and silver roof rails and door handles. To the rear the silver boot trim and chrome tail light surrounds are nice touches, whilst the overall feel is that of a 500 that hit the gym. The 500X is a successful design because, unlike its sibling, it doesn’t lean towards one gender. I don’t think I’d be the first to say that the regular 500 is a little bit ‘girly’, but this Schwarzenegger version just isn’t. On the inside, it’s very much the same. The seats, steering wheel and dashboard design are similar to that of the 500, but bigger. If I could sum up the cabin in one word it would be “grey”. The half leather eco-seats are dark grey, the dashboard is dark grey, and the plastics are all dark grey. There is a lack of any contrast. On one hand I understand; this is a crossover that is supposed to be rugged. But to live with every day some lighter plastics or shiny trim would have just been a little nicer. I like the dial pods, and the curvaceous multimedia pod which sits like it’s melting into the dashboard. The retro door handles suit the 500, as do the big buttons on the dashboard. Although I’m a little uncertain on the ‘eco-leather’ I do like the seats, with “500” stitched in white (some contrast!) and circular headrests. My test car came with a 1.4-litre, turbocharged petrol engine. It produces 140PS and 230Nm of torque. This is sent to the front wheels through a 6-speed manual gearbox. The figures don’t in spire a great deal of confidence; with 0-62mph taking 9.8 seconds and a top speed of 118mph. The reality is better than the paper facts though, because this feels like a rather pokey little motor. There are three drive modes; Auto, Sport and Traction Plus. Opt for Sport mode and the throttle response sharpens. Work the gearbox and the 500X feels rather nippy indeed. It will happily sit at motorway speeds in 6th gear, and feels lively on a B-road. The engine is quiet at motorway speeds, but gets a bit more vocal one you climb the rev band. Traction Plus mode makes the most of the 500X’s two-wheel drive. It distributes power between the front wheels to maximise grip, and considering that most crossovers never see tougher terrain than the football pitch car park will probably be more than enough. 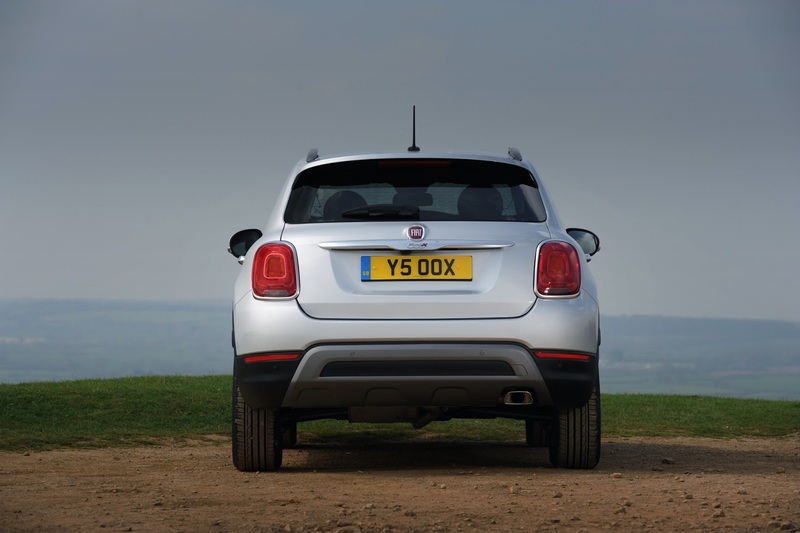 Should you wish for some proper off-road ability, then you’ll be pleased to hear that the 500X is available with 4WD. The steering is good; nicely weighted and sharper than I was expecting. The ride is a little bouncy, and this becomes noticeable on a longer drive. The flip side of this is that when you head briskly down a country lane you are greeted by far less pitch and roll than you would expect. The slower-speed drive round town is comfortable, and the bounciness is less apparent. And realistically that’s where the 500X will spend most of its time. Because the engine is only a little 1.4-litre, it’s rather economical. Combined fuel consumption is 47.1mpg, which is not bad for a petrol-engine car. With auto stop/start technology CO2 emissions are 139g/km, putting the 500X in VED band E. That’s £130 road tax in the first and subsequent years, and is a reasonable price for a family car. There is a problem though. If you’re a bit enthusiastic with your right foot, then your average fuel consumption will fall way below 47.1mpg. Also, the 2.0-litre diesel with 4WD offers 57.6mpg combined and 130g/km CO2. So the diesel just makes more sense all round. A crossover must be a ‘jack of all trades’ so to speak. It must be able to cope with the school runs, the shopping trips, the family holidays, the motorway slogs and the winter rescues. Realistically, there will be better cars suited to each individual task, but the 500X copes well enough with each task to make it a fantastic all-rounder. The cabin is spacious, and adults will be comfortable in the back. The boot is big enough for the shopping, and if you fold the rear seats down the 500X offers 1,000 litres of space. What’s more, you can have some rather handy toys for reasonable prices. The Comfort Pack (£300) adds keyless entry and go, adjustable driver’s lumbar support and a front armrest. The best option pack is the Dynamic Safety Pack which, for £750, adds a reversing camera, lane-departure warning, emergency braking function, and blind-spot warning. Add these to the standard kit which includes dual-zone air conditioning, Bluetooth hands-free via a rather good Uconnect system (upgrade to include satellite navigation for £550), and cruise control with speed limiter, and you have yourself a rather capable package. The 500X comes across as a playful car. The styling is a little bit cheeky, and oozes the cuteness of the 500. And yet there’s a rugged side to it. So whilst the 500X looks good in the shop windows of the local town centre (that’s reflections, not a parking mishap!) it also looks good after a blast through the country back roads, covered in mud. The drive isn’t perfect, but even the 2WD versions offer plenty of grip. I’d love to try out the 4WD version in some tricky conditions to see how it stacks up to the 2WD. The only other problem I found with the 500X is the perception of its family roots. Some people see it as simply ‘a big Fiat 500’ when in fact it’s so much more. And unfortunately that grey interior stops you wanting to spend loads of time sat behind the wheel, which is a shame. That brings my time with the Fiat 500X to a close. I started the week a little uncertain, in particular with the cabin appearance and market appeal. But over the course of the week the 500’s charm came through. This is a great family car, with a large boot, higher driving position and plenty of room for all. The availability of a 4WD version ticks another box, and for me ensures the 500X can truly be regarded as a ‘crossover’. Prices for the 500X start at £14,295, and the Off-road look starts at £19,065. For the Cross model I tested the price is £21,090 including £2,025 of options, and that represents rather good value for money. After all this was a capable, well-equipped family car for the price of a mid-spec Ford Focus. For more information head over to the Fiat website or visit a local dealership. The Fiat 500x; cuteness and capability all rolled into one.